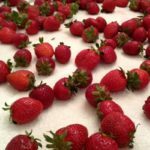 A recipe for a from scratch strawberry cake made using white cake layers, fresh strawberries, strawberry jam, and strawberry cream cheese frosting. Preheat oven to 350 degrees F. Grease 2 8-inch round cake pans. Line bottom of pans with parchment. Grease parchment and lightly flour pans (shake out excess flour). In a large mixing bowl, cream together the butter, shortening, baking powder, sugar, salt, and vanilla until light and fluffy, at least 5 minutes. Add the egg whites one at a time and beating well after each addition. Alternately add the flour and milk to the creamed mixture, beginning and ending with the flour, and mixing until combined. Scrap down the sides and bottom of bowl throughout the process. Pour the batter equally into prepared cake pans. Bake for 26 to 30 minutes, or until a toothpick or cake tester inserted in the middle comes out clean. Cool cakes for 10 minutes then remove cakes from the pans. Cool completely on a rack and then refrigerate layers for at least an hour. In a small bowl, combine chopped strawberries and sugar. Refrigerate 2 hours. Place strawberries and juice in a blender and puree until smooth. In a large bowl, beat butter, cream cheese, and salt at medium speed until creamy. Add 1/4 cup of the strawberry puree and vanilla and beat until combined. Gradually add confectioners sugar and beat until smooth. More strawberry puree or milk can be added if needed for spreading consistency. Use a serrated knife to cut down the top of one of the cake layers to level it (flat). Cut both layers in half horizontally. Place the bottom half of the leveled layer on a cake plate. Spread about 2 tablespoons of jam on top (thin layer). Spread some frosting over the jam. Arrange sliced strawberries on top of frosting. Place top layer half of the leveled layer on top. Repeat topping it with jam, frosting, and strawberries. Place bottom half of the other layer on top. Repeat with jam, frosting, and strawberries. Place remaining layer half on top. Spread remaining frosting over top and sides of the cake. Keep cake refrigerated.